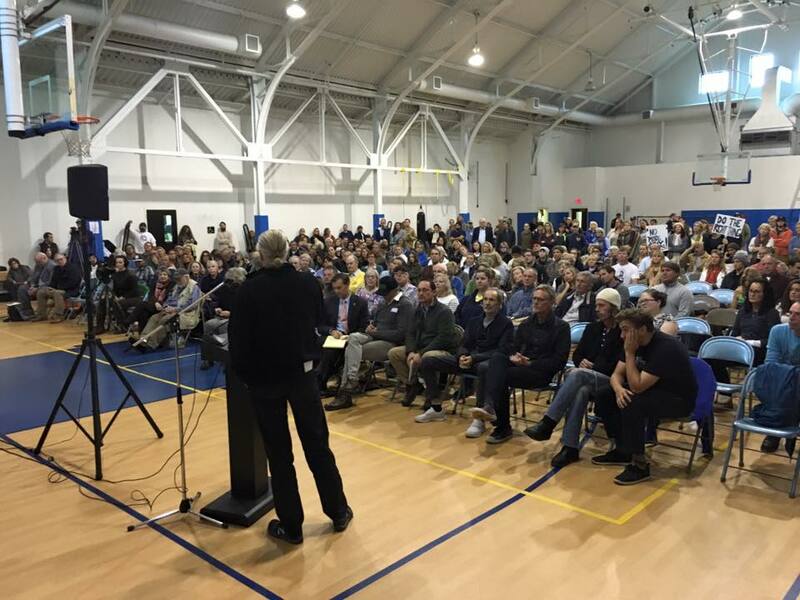 A massive crowd turned out to express opposition to the Army Corps Project being built in Downtown Montauk right now. Hundreds turned out, mostly concerned with the dune destruction happening as part of the project. People continue to get arrested on a daily basis in protest. Our own Tom Muse was quoted in this Newsday article. Full text below. 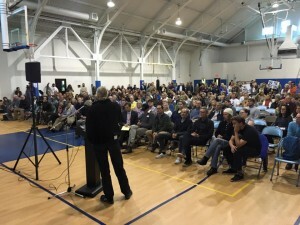 The East Hampton Town supervisor told a crowd of 250 Montauk residents Tuesday that he has asked about the legal ramifications of suspending or canceling a federal beach-fortification project that has resulted in protests and at least five arrests since Friday. Supervisor Larry Cantwell said at a packed work session that he made the inquiry to state and U.S. Army Corps of Engineers officials Monday, after several protesters were arrested attempting to stall the project. “I think the board needs to get some fundamental answers on some fundamental facts” before making a decision, Cantwell said. An Army Corps contractor recently began work burying 14,000 large sandbags along 3,100 feet of Montauk beach. The $8.4 million federally funded emergency project designed to protect downtown Montauk was authorized after superstorm Sandy struck Long Island in 2012. Protesters, galvanized by the sight of heavy machinery digging into the dune, formed a human chain in an attempt to block the project Friday morning, police said. Three were charged that day with disorderly conduct. Two more were arrested Monday, police said. Residents at Tuesday’s meeting called for an immediate cancellation or suspension of the project, which they said could actually worsen erosion, damage the coastal environment or make the beach undesirable for tourists. Sarah Conway, a Montauk resident who was among the protesters arrested Friday, said she was speaking on behalf of tourists who weren’t at the meeting. “They’re not in this room right now, and if they came back to find sandbags and the beach destroyed, they would not be returning to Montauk,” she said. Amy Duryea-Kelly, another Montauk resident, expressed concern for hotels and downtown businesses that the fortified dune is designed to protect, but added that the project seemed “not very well thought through” and “rushed.” Others said town officials need to press quickly to replace the sandbags with a more permanent solution: the replenishment of the beach using dredged sand, expected as part of the Army Corps’ 83-mile Fire Island to Montauk Point Reformulation Study. Cantwell said the town board had “reservations about this project all along” but “has tried to make it the best project it can [be] given the constraints” of state and federal authorities.